After outgrowing their three-bed semi, Leanne and Calum were looking for a fresh challenge and a new home offering character and plenty of renovation potential. When they spotted a run-down 100-year-old cottage on the outskirts of Dyce in Aberdeenshire, they didn’t hesitate to take it. Inspired? Browse more real home transformations to find out just what's possible. And take the first step towards your own home renovation with our handy guide. 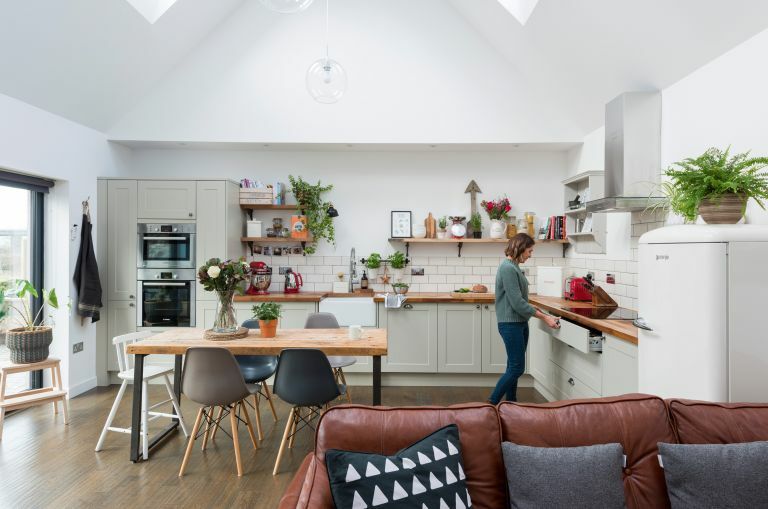 Aided by an architect friend of Calum’s, they reconfigured the layout and added a single-storey extension that encompassed the full height of the cottage. Now, the family has a country-style cottage inspired by the ski chalets Leanne and Calum lived in when they worked as chalet hosts in France. From stunning readers' homes to extension advice and decorating ideas, each issue of Real Homes magazine is packed with inspiration. Get the magazine delivered straight to your door every month with a subscription. ‘Halfway through the project,' says Leanne. 'Calum left me in the lurch as he had the opportunity to go offshore with his work. We’d no roof at the time and it was a rainy summer, so you can imagine what a nightmare it was. Leanne laughs, ‘It took us a while to develop our style. Instagram and Pinterest were both great for ideas, and I kept magazine cuttings in a scrapbook. We chose a country cottage feel mixed with a modern rustic look using reclaimed and upcycled materials. ‘Leanne was more driven than me when it came to interiors. She’s definitely got the best taste. The house would still be half-finished if I’d been in charge. Leanne would show me a picture of a chair she wanted to buy and I’d just be like, “I could just make it.” She always declined, for some reason...' says Calum. Leanne and Calum extended and renovated their cottage to create the perfect family home.